The game of black jack is of unknown origin, but is first mentioned by the famous author Miguel de Servantes. Servantes wrote Don Quixote and in that book there are 2 characters that are cheaters who go around trying to steal others' money at the game called "21". Thus, the oldest reference we have of the game being played is dated in the year 1601. The game was introduced into what is now the United States around colonial times. 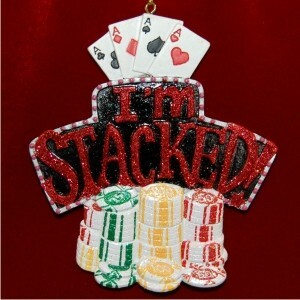 Blackjack is now the single most played card game in all casinos around the world. 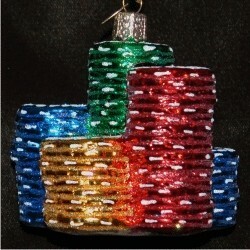 If blackjack's your game, we're sure to have the perfect blackjack ornament that's right for you. 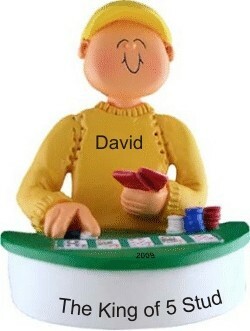 Poker, on the other hand, has a much more recent development. Our first written account of poker dated from Louisianna in 1829. It's additionally mentioned as the game of choice on Mississippi river boats in 1843, and is later known to be the game played "out West" in saloons. 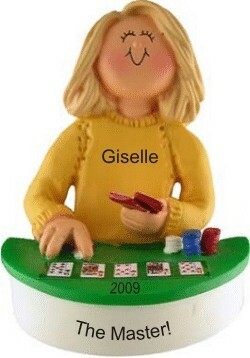 Today, the game has a number of varieties and rules, most notably of late Texas Hold 'Em. 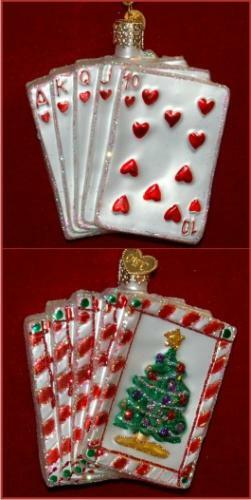 We offer poker ornaments in resin as well as in blown glass, a straight flush and in other designs. 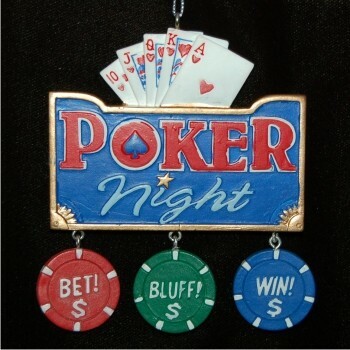 Importantly, while poker originated with men in gambling halls, several notable women have soared to the top of professional players. 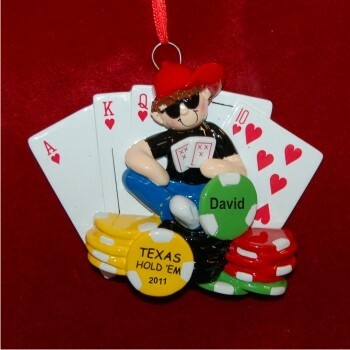 You can find both men and women in our personalized poker Christmas ornaments.